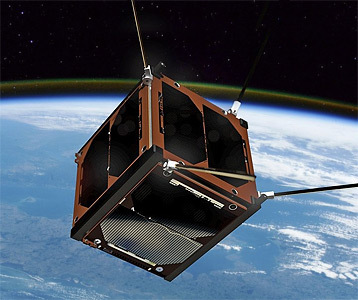 Delphini-1 or AUSAT-1 is the first satellite from Aarhus University, a proof-of-concept project. The main purpose is to assemble, test and operate a scientific satellite. The satellite is a 1U CubeSat equipped with a camera and communications gear; the 1U-NanoEye. It was supplied by the Aalborg-company GomSpace as an assembly kit. A group of AU students were trained by GomSpace to assemble and test the satellite. AU installed a control room at the campus, and some of the students were involved in assembling and testing the communications equipment, and operating software to control the satellite and the payload. They also develop new software and algorithms and design experiments that can be carried out with Delphini-1. The satellite was launched to the ISS in late 2018 to be deployed from there on 31 January 2019.